I started learning Western violin in Scotland in October 2004. 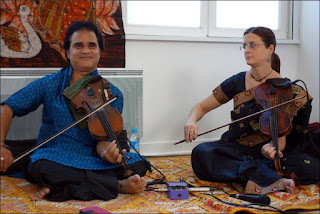 Since April 2008, however, I have been learning north Indian (Hindustani) classical violin from Pt. Sukhdev Mishra in Varanasi. I started teaching (Indian) violin privately in Varanasi in 2011. 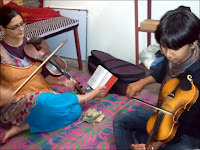 Since 2012 two or three more children/adults have shown an interest in taking classes with me, but often they underestimate the personal investement it takes to learn violin. Parents will ask "How long will it take to complete it?" or whenever I tell them a (reasonable) fee for private classes, it is too much for them. And anyway, when the children do try my violin it seems far too difficult for them and that's that. It just seems people here don't value culture enough to be interested in something new and "non-lucrative" like violin! 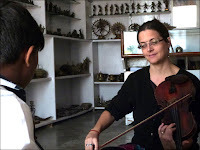 Finally I came up with a good idea: My first student had started learning on a super-cheap 1500-rupee violin his father had bought him from Bhopal, and after one year I had brought him back a 4000-rupee violin from Varanasi, which his father had bought from me. So why didn't I simply buy the teacher's son's first violin, which was kept useless in its dusty bag? This took a bit of convincing from his father, but eventually he agreed to sell it to me for 1000 rupees (less than €15! ), and Ajay managed to pay me back in a few installments from his modest earnings as a henna tattoo designer. A few weeks later my friends Jérôme and Marie-Christine Chaumié from the Partage et Culture Sarasvati association were coming to India, so I asked them if Jérôme (who is a violin teacher in France) might be able to find a good violin case. They did have some spare ones at his music school, so they brought one with them for my student. Luckily a French bridge was still kept in the case, so I replaced the poor-quality one. 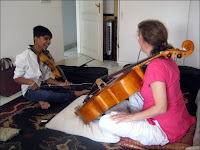 Since then Ajay's violin has been sounding a lot better, and it has a solid case! Since he's had his own instrument, Ajay has been making steady progress on the violin. 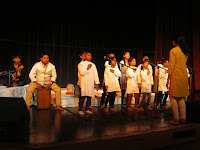 Today he sings in tune, his ear is getting finer and finer, he's getting really good at the Indian "sliding" technique, and he has developed a real interest in Indian classical music (his school friends tell him he's mad to listen to such weird music)! 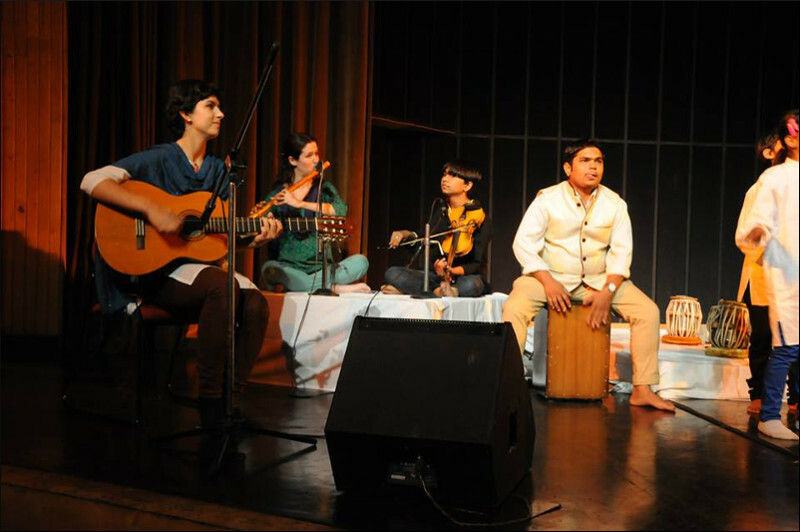 He has played quite a few bhajan (devotional song) concerts with - and without - me in Khajuraho, and he really loves it. 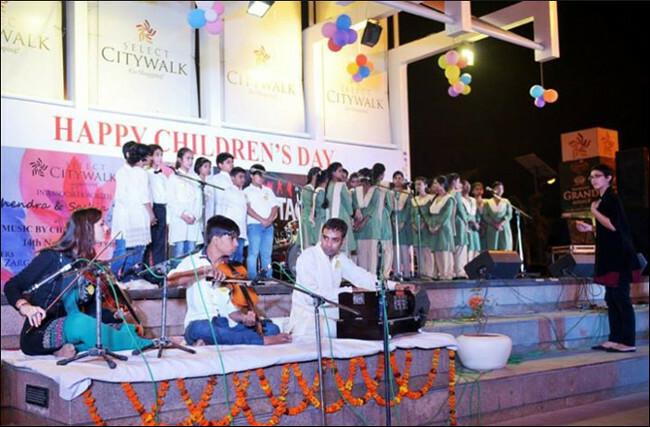 Our first concert took place in June 2014 on the Brahma Temple terrace at the occasion of a Blue Bank event (check-out our EcoFriendly Promise section for more information). 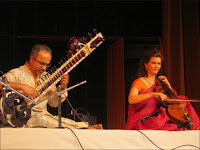 In August 2014, the New-Delhi-based Dutch-Indian couple of world-renown musicians Saskia (Indian cello) and Pt. 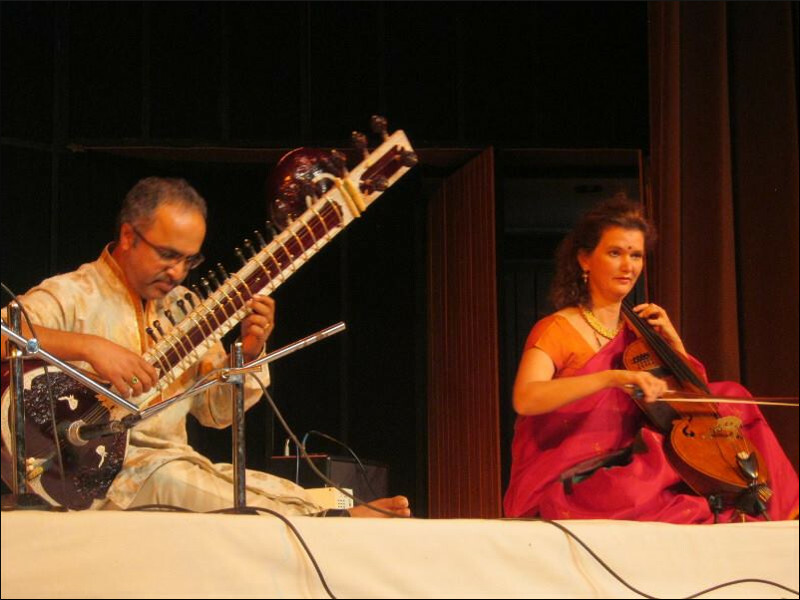 Shubhendra Rao (sitarist and disciple of Pt. 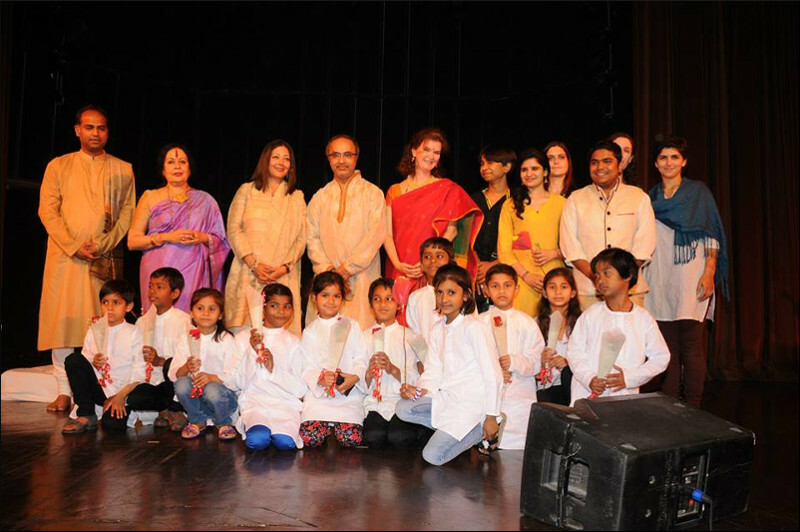 Ravi Shankar) inaugurated their Shubhendra & Saskia Rao Foundation, with the objective "to promote [Indian] classical music, not in an isolated and elitist way, but by connecting it to today's world" and to "empower and uplift people through music". To read more about their vision, mission and objectives, click here. *The child's name has been changed to protect his identity. Centre Prana (France) - Indian healthcare & yoga for all in Vienne (although a for-profit company, Prana is involved in a social entrepreneurial approach through the implementation of disinterested management). 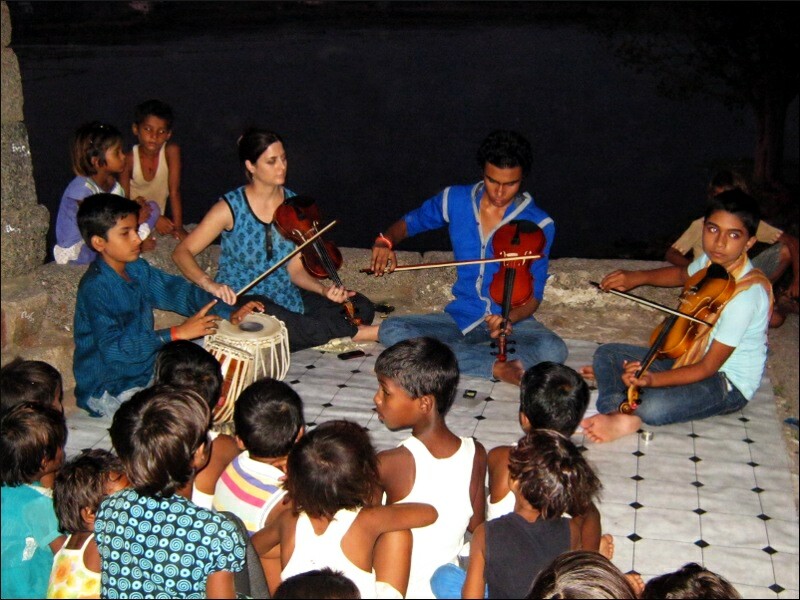 Devidine Association (France, Italy) - education of children, protection of women, economic and sustainable actions since 2004, in an indigenous village about 10 km away from Khajuraho. Ganpati (Norway) - to improve the living conditions of poor people in and around Khajuraho. The assistance provided should be sustainable and respectful of people's right to govern their own lives.